I'm sure I sound like a broken record, but the key to a relational education is reading living books. Chances are you've heard the term, and I thought I'd share with you my understanding of what it means. A living book is one that is written by one author who is passionate about their subject, and is usually written in a narrative (storytelling) style. The language is beautiful, not dumbed-down or childish. It's a book that draws you in and changes you. Even among homeschooling materials, it's much easier to find a dry, dessicated textbook than it is to find a living book. Sometimes, it can hard to find the very best books, because they might be out of print but not yet in the public domain, so are still copyrighted and can't be reprinted. However, all is not lost! Many wonderful, living books are available and more are being made available all the tiem. 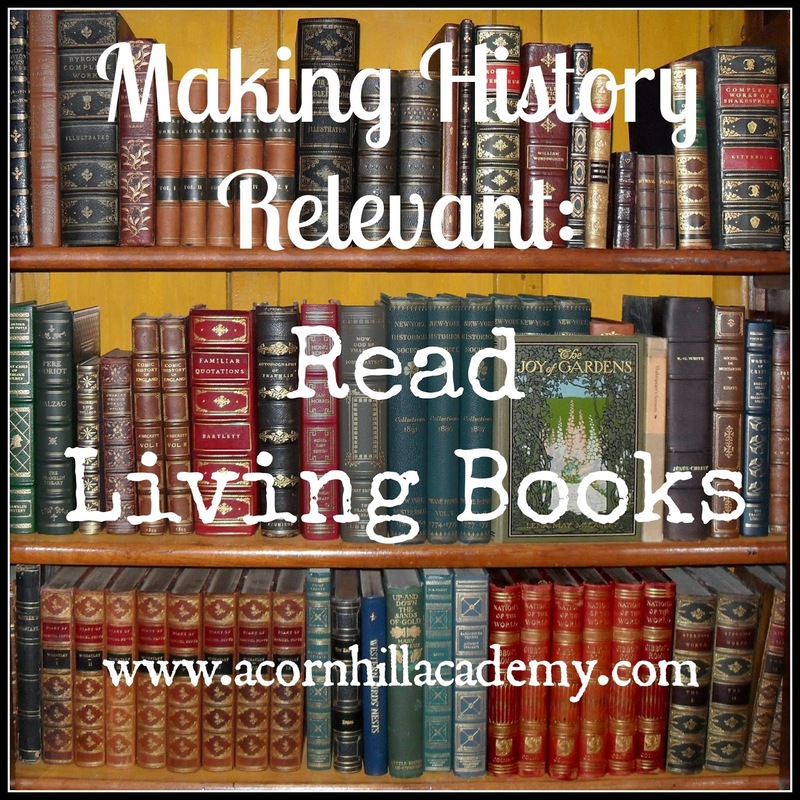 So, how does one use living books in history? I don't know about you, but my entire educational experience in public school revolved around textbooks. Honestly, I remember very little, beyond copying notes from the overhead projector while one of my favorite teachers lectured about American history. He was considered one of the best - and all I had to do to get an "A" was copy down the notes and study them for tests. Don't get me wrong, I adored him as my teacher, but I am not sure he helped any of us on the road to understanding or appreciating history, you know? As I've walked the path of education with my children, and we've learned more about Charlotte Mason and her principles, I've become very picky about the books we read. Once we read "Our Island Story" together, for example, British history (and therefore American history) came alive to us in a brand new way, and I began to see how much fun history could be. FUN! I never thought I'd say that. I mean, have you read most non-fiction that's available these days? Doesn't most of it read like the kind of textbooks that make you fall asleep and drool in the library? Or is that just me? One great way to make history come alive is to add some biographies to your history readings. Have you read the D'Aulaires' books? They have beautiful picture books on historical figures such as Christopher Columbus, George Washington, and Benjamin Franklin. My girls and I have enjoyed these and I'm getting ready to read them again with my son. Beautiful Feet Books has reprinted these gems, and you can see them here. 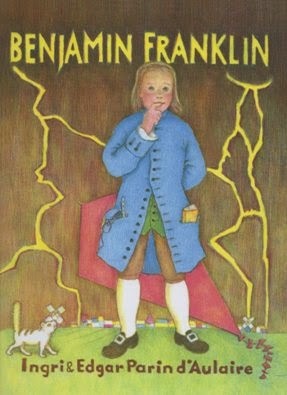 Another series is the Childhood of Famous Americans. These aren't my favorite, but many people like them. They are readily available, your library probably has many of them, and they are easier chapter books for young readers. Here is a list of the books in this series, separated into historical eras. Here is a list of ones currently in print, available from Greenleaf Press. Landmark also has lots of great biographies, and many of them have been reprinted. Click here for the list of the ones Greenleaf Press has available. I am also learning to love Messner biographies, most of which are out of print, but you can often find them at library sales and even in thrift shops if you keep an eye out for them. Valerie Jacobsen, of Valerie's Living Books, has a list of all the titles here. Yesterday's Classics - Lisa Ripperton has republished many, many wonderful books from the "golden age of children's literature." I have many books from Yesterday's Classics, both printed an in ebook form, and have been very, very happy with the quality. If I want an old book, I check to see if Yesterday's Classics has it before I look anywhere else. 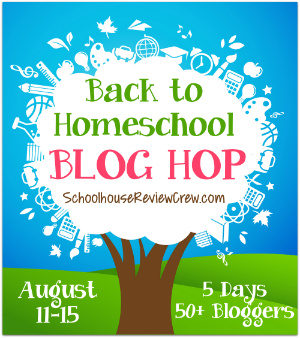 She also offers a wonderful program called Gateway to the Classics, which I use in my homeschool, and is worth it just for the ebooks you get, not to mention all the other features she's added. I highly recommend checking it out. Ambleside Online - they provide a free, online curriculum, years 1-12, complete with lesson plans. You have to provide your own books, but many of them are available online for free. TruthQuest History - Michelle Miller put together these wonderful books, and they are a treasure trove of lists of living books for all ages, and all time periods of history. She lists possible spines, as well as biographies, historical fiction, and even movies when they are available. Simply Charlotte Mason's Bookfinder - You can search their database to see what books people have used. Charlotte Mason Help - not only will you find tons of helpful articles here on implementing Charlotte Mason's principles in your homeschool, but she has put together book lists for grades 1-6 as well. Living Books Library - The lovely ladies who own this library have helped me plan my curriculum for my own children for two years now. Check out Liz's "Top Picks" lists for all kinds of lovely books. Sage Parnassus - Nancy blogs about a living education and Charlotte Mason, and lists wonderful books, most of which have been new to me. Other libraries of living books - check this link! It's not a comprehensive list, because the list is always growing, but see if you can find one near you. When you're looking for used books, I like to check http://used.addall.com first, because it scans many online book stores for the best price. I love Amazon, Abebooks, and Biblio.com, but I always check Addall first. You know, before I started homeschooling, I thought I was well-read. Then I started meeting people who were far more intelligent than I, who had read books I'd never even heard of, and I will be forever grateful to them. The world of living books is larger than I would ever have imagined, and I'm enjoying discovering these treasures along with my children. I hope you will take a look at some of these and see how much fun you can have, and how much you will all learn, by reading them with your children.